1977年 Spring Came to Yimeng Mountain; Laughter At the Paper Tiger; selected for the Fine Arts Exhibition for the 50th Anniversary of the PLA of China. 1984年 10th World ArtFestival, France; 6th Asian Painting Art Exhibition, Japan. The Peasant Mother and Daughter, winner of the golden prize of the 6th Fine Arts Exhibition of China at the National Museum of Fine Arts, Beijing; collected by Beijing Association of Fine Artists. 1985年 The Old Village, the Secondary Prize of the 3rd Youth Fine Arts Exhibition of China at the National Museum of Fine Arts, Beijing; collected by the National Museum. 1986年 First Oil Painting Exhibition of International Arts and Literary Circles at the National Museum of Fine Arts, Beijing. 7th Asian Art Exhibition, New Delhi, India. Portrait of Wife, in the Contemporary Oil Painting Exhibition at the National Museum of Fine Arts, Beijing, collected by the National Museum. 1987年 Attended the Opening of Contemporary Chinese Oil Painting Exhibition at New York, USA, with Mr. Wang Huaiqing, Mr. Ai Xuan and the leaders of China Association of Fine Artists, and as a visiting scholar for the academic investigation and lecturer in USA; International Art Exposition, New York, USA; The Chinese Realistic Painting Exhibition at Modern Museum of Art (MMOA), Santa Ana, California, USA. Wang Yidong’s Oil Painting Exhibition at the Hefner Gallery in New York, USA. 1988年 The Morning For A Girl Named Erniu, selected as a charity donation of auction by Sotheby for the maintenance of Venice and the Great Wall. Wang Yidong’s name was sculptured on the Monument of Mutianyu Great Wall. Oil Painting Exhibition of Human Body at the National Museum of Fine Arts, Beijing . 1990年 Group Exhibition in Modern Art Museum, Dallas, Texas, USA. International Art Fair, Chicago, USA. Singapore Exhibition of Oil Paintings and Sculptures of the Central Academy of Fine Arts. 1991年 Wang Yidong’s Oil Painting Collection published by Hunan Fine Arts Publishing Company. The Wind Has Stopped took part in the Christie’s auction, Hong Kong. 1992年 The 20th Century-China, at Central Academy of Fine Arts, and won the Excellent Prize for New Productions. Group Exhibition of Teachers of the Central Academy of Fine Arts, Hong Kong. 1993年 Inaugural Exhibition of Schoeni Art Gallery, Hong Kong. Exhibition of Realistic Paintings, the National Museum of Fine Arts, Beijing. Exhibition of Wang Yidong’s Oil Painting, Schoeni Art Gallery, Hong Kong. Asian Art Festival, at World Trade Centre, Singapore. Art Asia’ 93, Hong Kong Convention and Exhibition Centre. Wang Yidong’s Oil Painting Collection published by Suzhai Publisher, Macau. 1994年 Art Asia’94, Hong Kong Convention and Exhibition Centre, and as a special guest to join the academic activities. Images of Women I, Schoeni Art Gallery, Hong Kong. 1995年 Vision of China – Paintings by Contemporary Chinese Artists, Pacific City Club, Bangkok, Thailand. Art Asia’95, Hong Kong Convention and Exhibition Centre. Taipei Art Fair’95, World Trade Centre, Taipei, Taiwan. Images of Women II, Schoeni Art Gallery, Hong Kong. The Swiss Rado Gallery collected one of Wang Yidong’s paintings, which was the only one the Gallery collected among Asian artists. 1996年 Images of Women III, Schoeni Art Gallery, Hong Kong. Winter Exhibition, Schoeni Art Gallery, Hong Kong. The Contemporary Chinese Oil Painting Exhibition-from Realism to Post-Modernism, jointly by Galerie Theoremes, Brussels, Belgium and Schoeni Art Gallery, Hong Kong. Invited by Swiss Rado Gallery and visited Switzerland for the ceremony of the oil painting of Wang Yi Dong collected by the Rado Gallery. The Exhibition of Chinese Oil Painting Association, Beijing. 1997年 5th Anniversary Exhibition of Schoeni Art Gallery, Hong Kong. Images of Women IV, Schoeni Art Gallery, Hong Kong. The opening ceremony of 10th Anniversary of the Chinese Oil Paintings collected by Hefner Collection, USA. Invited by Macau government to took part in the opening ceremony of the Exhibition of Wang Yidong and Ai Xuan, Macau. 1998年 Summer Exhibition, Schoeni Art Gallery, Hong Kong. Eastern and Western Realistic Oil Painting Exhibition, Berlin, Germany. 1999年 The Exhibition of Wang Yidong’s Oil Paintings, Schoeni Art Gallery, Hong Kong. Images of Women V, Schoeni Art Gallery, Hong Kong. The third volume of Wang Yidong’s Oil Painting published . Professorship of the Central Academy of Fine Arts. Oct.
2000年 Images of Women VI, Schoeni Art Gallery, Hong Kong. 2001年 In Sept.Singapore Art Exposition, Singapore. Exhibition of Paintings on Paper, Shanghai Yibo Gallery, Shanghai. 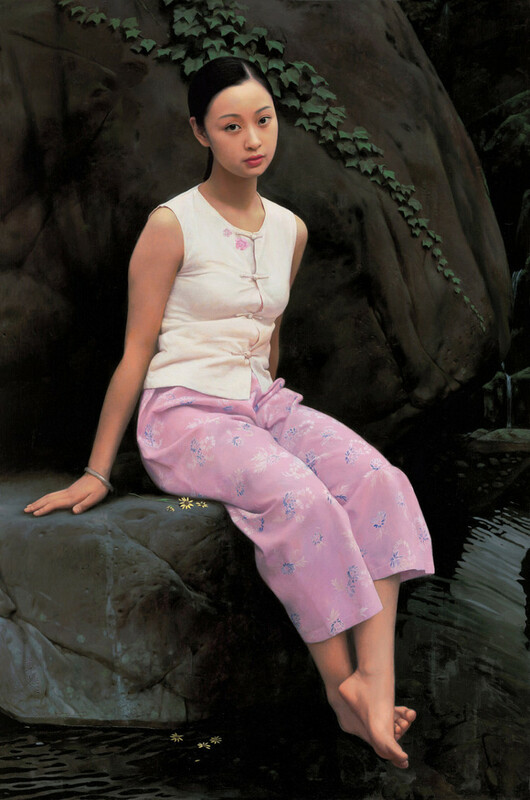 In Nov. Chinese New-Realistic Oil Paintings, Liu Haisu Gallery, Shanghai. 2002年 Contemporary Paintings and Sculptures by 33 Artists-Celebration Exhibition for the Opening of Beijing Schoeni Art Gallery, Schoeni Art Gallery, Beijing. Images of Women VII, Schoeni Art Gallery, Hong Kong. 2003年 First Beijing International Art Biennial Exhibition, National Museum of Fine Arts, Beijing. Excellence Prize of the 3rd Chinese Oil Painting Exhibition, National Museum of Fine Arts, Beijing. Wang Yidong’s Drawings & Sketches Exhibition, Schoeni Art Gallery, Hong Kong; and the Collection of Wang Yidong’s Drawing Published. In Sept.2003 Acceded to the Directorship of Fundamental Art Skill Training Section, the Central Academy of Fine Arts. 2004年 In July Resigned from the Director of Fundamental Art Skill Training Section,the Central Academy of Fine Arts. In Sept. Professor, Beijing Art Academy. National First-class Artist of Fine Art. In Oct. Naivete Years; The Magpie in Mountains; Sunshine in Winter, the First Chinese Realistic Oil Painting Exhibition, National Museum of Fine Arts, Beijing. 2005年 From May to July Joint Exhibition of Chinese Oil Painters: Wang Yidong, Cai Guoqiang and Zhang Hailin, Museum Kuppersmuhle Sammlung Grothe,Germany. In Sept. Snow in March, Beijing International Art Biennial Exhibition, Beijing. From 23 Oct. to 1 Nov.The Sun in Remote Mountains; Chinese Trumpets Warmly Welcomes the Newlyweds; Wishes; the 2nd Chinese Realistic Oil Painting Exhibition, National Museum of Fine Arts, Beijing. 2006年 14-23 Oct. By the Yihe River; The Remote Place in My Heart; the 3rd Chinese Realistic Oil Painting Exhibition, National Museum of Fine Arts, Beijing.